Draw a clock on the floor, on paper, or create a clock with tape. Place the hours from 1 to 12 on the clock. Make the 3, 6, 9, and 12 bold or larger for this beginning time activity. Talk with children about what time means. Discuss the difference between analog and digital. Practice reading analog and digital clocks. Practice converting between analog and digital time. Talk about relative time (earlier, later, etc.). Students will recognize quarter hours. Students will verbalize quarter hours. Students will understand the relationship between analog time and digital time. Students will be able to follow verbal instructions and display the correct time on the clock. Students will verbalize their understanding of relative time. Introduce concepts of earlier, later, tomorrow, yesterday, etc. Talk about units, proportions, and multiplication: turning one unit (15 minutes) on the clock takes Bee-Bot to the 3, turning two units (30 minutes) on the clock points Bee-Bot to the 6, etc. Introduce time zones and talk about the current time in other parts of the world. Make this an addition and subtraction lesson. Introduce the concept of the solar system and the earth’s rotation and the effect on time. Create a history lesson by talking about daylight savings time. One of our club parents has asked me if BeeBots would make a good Christmas present, and whether I have any other suggestions as well. So I thought I’d turn it into a post! Yes, BeeBots make a great gift, but are particularly well-suited for group play or for setting challenging or creative activities. So perfect for getting down on the floor with your child to invent your own game. It’s possible to buy just one, and there are also some fun mats that are available (In the club we’ve been making our own, with a big clear sheet of PVC marked with a grid). Ideal for 3 – 6 year olds. I’m a huge LEGO Mindstorms fan, but they are indeed a bit pricey. If you’ve really got a robot nut in your house, then it is an amazing gift. The best bit is that you can programme it in Scratch. The new EV3 has it’s own icon-based software which is even easier to use. Really starts becoming accessible to kids around 7 years old or so. This Early Machines Set on my wish list for the Club, if there are any generous Santa’s Helpers out there 😉 Do check out all of the other LEGO Educational products, as there is quite a fantastic range. Ideal for 3 – 6 year olds. Sifteo Cubes are an award-winning new interactive game system using digital tiles, in the timeless play tradition of legos, building blocks, and domino tiles. They can be tilted, flipped, shaken, and put side by side. Sifteo Cubes communicate wirelessly and respond to each other and your gestures. There is an ever expanding catalog of games to play, and an excellent Developer Platform if you feel inspired to create your own (more advanced programming skills required). All ages. 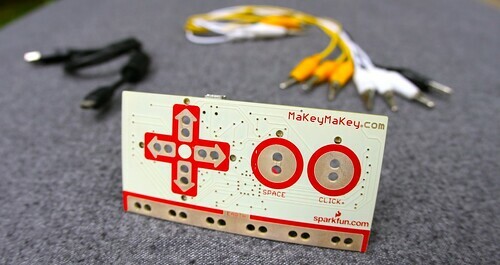 The kit includes the MaKey MaKey board, Alligator Clips, and a USB Cable. Alligator Clip two objects to the MaKey MaKey board. 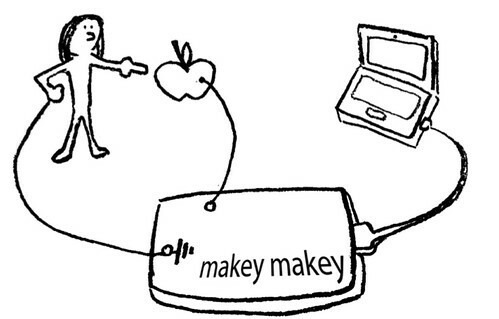 For example, you and an apple.When you touch the apple, you make a connection, and MaKey MaKey sends the computer a keyboard message. The computer just thinks MaKey MaKey is a regular keyboard (or mouse). Therefore it works with all programs and webpages, because all programs and webpages take keyboard and mouse input. Ideal for 5 – 12 year olds. SparkFun has a TON of ideas of things you can build, plus lots of other fun inventor’s kit. I would totally do this with my 4-and-3-quarters year old, but otherwise I’d say 6 – 12. Ok, this one is a recipe, and not something you can buy off the shelf (well – you probably can somewhere, but WAY more fun to make it yourself. And economical). You will need to have some LEDs and batteries handy. “Making play-dough creatures is fun, but making them with light-up eyes and moving parts is even more enjoyable. We thought it would be better still if we could make the circuitry out of the dough itself! Most play dough is already conductive, but we needed a way to insulate the conductive dough. We came up with a sugar-based dough that works well as an insulator. It’s pliable and resistant to blending with the conductive dough. Find out how to make your own Squishy Circuits on the MAKE website. All Ages. The Queensland Government’s Department of Education, Training and the Arts have developed a wonderful series of resources for using BeeBots in a Primary ICT setting. I highly recommend you start with their introduction to using BeeBots in the Classroom “Making your Classroom Buzz: Ideas and Activities for the Early Phase”, developed by Kristine Kopelke. Bee-Bots love buzzing together. In this activity, students work collaboratively to develop a flight plan for their Bee-Bot. They may draw the path on paper, write down a sequence of instructions or use the Bee-Bot button sequence cards to map out what they want their Bee-Bots to do. Once the students have developed their flight plan, they can program their Bee-Bots and then press go at the same time to see some synchronised buzzing. Barrier games are a great strategy to use to develop students oral language skills. 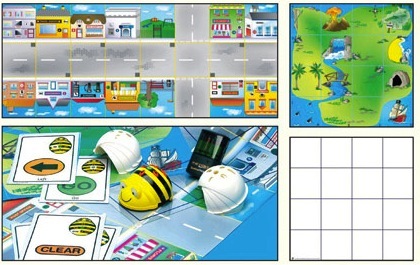 For this activity, you will need two identical mats, a board or a divider and two Bee-Bots. To try this activity in your class, students place a Bee-Bot and a mat on each side of the divider. On one side of the divider a student or team of students decides the location on the mat where the Bee-Bot will be to start with. They then tell the other student or team on the other side of the divider. The student or team that is providing instructions, then programs their Bee-Bot and provides the other student or team with instructions so that they can move to the same spot. The goal is for each student or team to help their Bee-Bot make it to the same location on the mat. Once all instructions are given, students check if the locations match and if so win the game. The Little Bee-Bot that could. You may have noticed that every Bee-Bot has a tow bar on their back. You can attach string or rope to the tow bar in order to have the Bee-Bot tow other objects. In this activity, students can investigate the different loads that Bee-Bots can tow and how the weight of the loads can effect the speed of the Bee-Bot. Students can also try placing the Bee-Bot on surfaces placed at different angles to see if the Bee-Bot can carry the load up or down a slope. Teachers may use the text ‘The Little Engine that Could’ as a stimulus for this activity. Students could then collaboratively develop a class big book of their own innovation on this text titled ‘The Little Bee-Bot that could’. Illustrations could include digital photographs of the students experimenting with different loads. Turn up the music in your class and get your Bee-Bots and students moving. Challenge students to program the Bee-Bots to dance to the music. Invent some names for the dance steps they create. Students could also work collaboratively to make the Bee-Bots dance in sequence.